Exhaust wrap will give you more than just awesome looking headers. You’ll also see a reduction in temperatures around the exhaust as well as more horsepower. These benefits are the result of increased engine efficiency. You’ll get more horsepower because the wrap will keep exhaust heat in the headers instead of dissipating to other areas of your engine. When heat is contained within the exhaust system it will improve the flow of exhaust gasses throughout the entire system. The faster exhaust gasses move, the more power you’ll receive. Combine exhaust wrap with a high flow catalytic converter and performance muffler and you could see an even bigger horsepower boost. 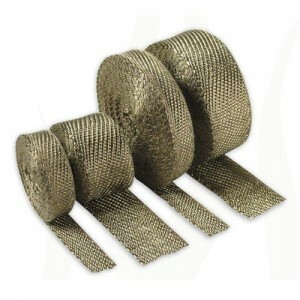 In a dyno test by Hot Rod Magazine they found exhaust wrap significantly reduced engine temperatures. On unwrapped headers, the temperature near the cylinder head was 1,156 degrees Fahrenheit. After the wrap was applied, the temperature dropped to 972 degrees Fahrenheit. Not only did the exhaust temperature decrease, but so did other areas of the engine. On their test they found that the valve covers on their 600 horsepower small block Chevy test engine dropped from 750 degrees Fahrenheit to only 619. What’s Included in an Exhaust Wrap Kit? 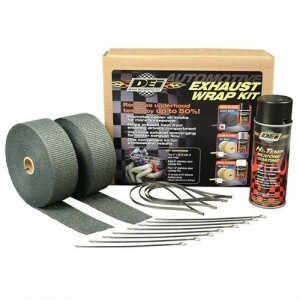 We recommend the DEI kit because it includes everything your need to wrap your headers all in one box. Whether you have a V8 or a Harley-Davidson, this kit will cover your headers all the way from the head bolts to the end of the collector. 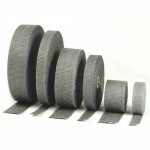 This kit includes two 2″ x 50 foot rolls of wrap – enough to complete any job with extra to spare. 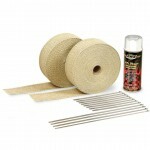 Plus, you’ll get one can of high temperature Silicone coating and stainless steel locking ties. It is best practice to get the wrap wet before installing. However, you need to be careful about how much you use. Run the roll under small stream of water. Do not soak or submerge wrap in a bucket. Most wraps, especially DEI brand products, have a special coating that you do not want to remove by using too much water. 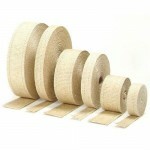 Also, a soaking wet wrap will make a mess while you’re trying to install it. As you are running the wrap under water, squeeze the wrap until it feels soft and there are no more hard spots in the roll. 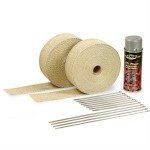 Have a squirt bottle of water handy while you are installing the wrap. If it begins to dry out before you are finished spray a little water onto the dry area. A few other things to note. 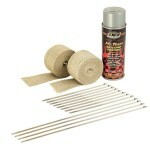 When installing wrap you would normally apply the silicone coating at the end. However, if you have mild-steel headers, you should apply the coating before wrapping. 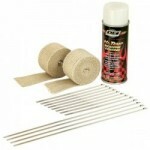 This will seal the headers from moisture that gets trapped under the wrap. If you’ve been looking at wrap reviews online, you’ll notice that many people claim wrap ruined their headers. To avoid this same fate, make sure you seal them with silicone first.